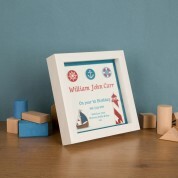 This wonderful and unique Nautical 1st Birthday Keepsake for a baby boy will arrive fully personalised with the details of this Special Day. 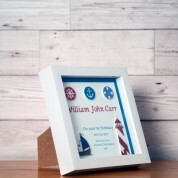 The print and 3D nautical characters are all 'In House' designed, UV printed and laser cut on to shiny white perspex. This process gives an amazing quality and makes the colours stand out immensely. This shows the intricacies of the design and quality of the final product. The little nautical themed characters are superbly finished with unbelievable finesse of laser cutting providing interesting detail. 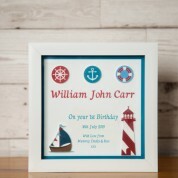 The nautical design features a deep red lighthouse followed by an adorable sail boat with deep red and blue flags. 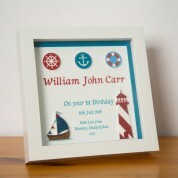 To add to the design further we have created three nautical theme icons at the top of the design for that extra touch. A brilliant gift idea for anyone celebrating a 1st birthday. 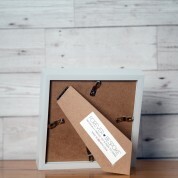 The white box frame has the ability to either be wall mounted or stand alone similar to a traditional frame. We will not only print the first name of your special little boy but also the date of his 1st Birthday and a short personal message. 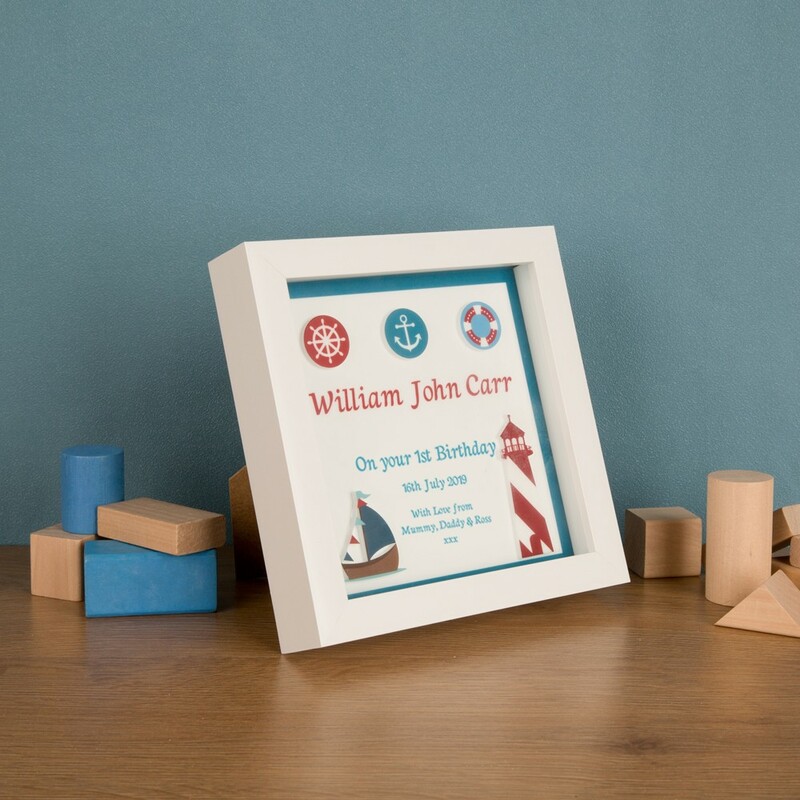 To complete your personalisation experience and to add to the great impression, your frame will also be presented in an attractive white branded presentation box.